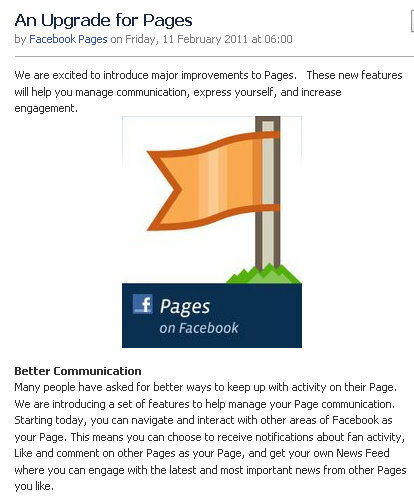 This morning Facebook just announced an upgrade for pages, which you can read about in detail here. As a marketing professional who specialises in social media training and consulting, Facebook both drives me crazy and delights me with their constant changes. The driving me crazy part is that it’s so difficult to keep up to date with the way things are done for personal profiles, pages and groups. Every time I feel like I have mastered one small section of Facebook…it changes. One button disappears, another changes its name (remember “become a fan” instead of “like”?) or a totally new section magically appears. The delight is that it is through all these changes, Facebook shows how in touch they are with their customer’s needs. Social media is a brave new frontier in which Facebook are the leading pioneers. I love how they listen to feedback and constantly address any problems that arise along the way, ranging from increased security to new ways to interact. Though not every new feature becomes a firm favourite, when it really comes down to it Facebook is an absolutely amazing free tool for business. I am always a little baffled by the public outrage of some users when anything is changed . One of the secrets of Facebook’s success is that most of the 500 million active users seem to feel some ownership, however after all, it is their program to alter as they please. Another challenge Facebook has is that they need to cater for the needs of a very large number of diverse people simultaneously, and the old adage “you can’t keep everyone happy all of the time” certainly applies here. The majority of changes truly are for the better, and don’t take long to learn, especially with clear explanations from Facebook, not to mention ready access to all your friends for help if you’re ever stuck! One great tip to keep up to date with all these Facebook changes is to “like” the official Facebook pages and visit these regularly – they will notify you of changes with authority and in detail. There are a few of these which range in purpose. 3. http://www.facebook.com/help/ is the place to type in any queries and find answers from both Facebook and other users. That’s just a start, but those four will keep you on top of any major upgrades. Facebook even has their own “tv channel” – Facebook Live which I’ve not explored in detail yet but looks interesting. I’m off to explore the new changes, and to get used to them….before they change again!